Today we have a guest blog post written by Jeremy Ayers, Associate Director of Federal Education Programs at the Center for American Progress. Thanks for your great insight, Jeremy! 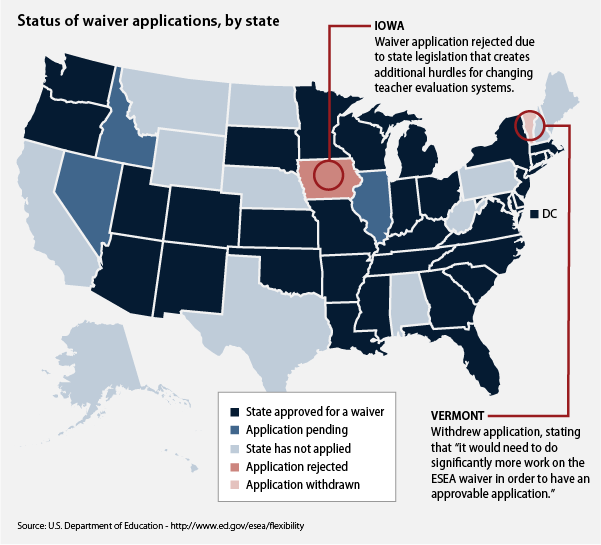 The U.S. Department of Education has now granted waivers from parts of NCLB to 33 states (see map). At least 4 more plan to apply in early September. That’s a lot of states changing the ways they do school improvement. No longer are districts required to set aside federal money for school choice and tutoring, and struggling schools don’t have to implement one of the four SIG models –unless they’re already getting SIG money. Identify the bottom 5% of schools as Priority schools, and implement interventions that align with seven principles outlined by the Feds (but still far looser than current law or SIG). Identify an extra 10% of schools with large achievement gaps as Focus schools, and then devise their own interventions for those schools. Ensure continuous improvement in all Title I schools and ensure that learning improves in every school statewide. So what are states proposing to do? The short answer: some things that are promising, but nothing that would alter the orbit of the planets. 12 states would continue to use choice and/or tutoring as optional (but not required) improvement strategies. 11 states would continue to ask or allow districts to implement one of the four SIG models. Several states would require a SIG models after a school fails to make progress implementing a different intervention. Almost every state would rely more heavily on diagnostic assessments to determine their course of action. 24 states would do so in Priority schools. 25 would do so in Focus schools. A number of states would use diagnostics to review and plan action in struggling districts. Almost every state would stop identifying low performing schools every year. Instead, for Priority Schools, 22 states would do so every 2 years, 2 states every 3 years, and 1 state every 4. For Focus schools, 18 states would do so every 2 years, and 2 states every 3 years, while 6 would continue annual identification. At least 5 states borrowed a page from the Mass Insight playbook, making clear not only what they expect low-performing schools to do, but also how much progress they expect them to make, data they will use to measure progress, plans for mid-course corrections, and consequences if progress is not made. Most states didn’t spell out their plans in detail. Take Ohio. The state said it would analyze data in Focus schools and then train teachers to work with struggling subgroups. That’s it. Nothing about what kind of training, by whom, or how often. And what happens if this undefined training doesn’t work? No word. Unfortunately, Ohio was not alone in scrimping on info. Overall, waiver plans contain nuggets of good or promising ideas, but few took a comprehensive or detailed approach to turnaround. The task ahead for observers is to keep a close eye on implementation to see exactly what states wind up doing –and how well.